I thought it would be a nice idea to talk about my daily skincare routine that I do every morning without fail (unless I'm staying at my boyfriends where we more than likely got drunk the night before, leaving me lying in bed all day making him cook me food). I have quite sensitive skin, especially around my eyes as I suffered from eczema a few months ago, it thankfully has now disappeared but can return with a vengeance, if I don't make sure to keep my skin clear of any make up over night. Because I'm completely paranoid of it coming back I really have to make sure I use natural products or products specially designed for sensitive skin. I find if I use a product that isn't very natural, my skin can go very blotchy even a bit rashy at times! Some products that I've used in the past that have reacted with my skin are Garnier cleansers and toners, L'oreal gel face wash and actually some Clinique products, which upsets me as I never used to have this problem and now I can't really use them any more! 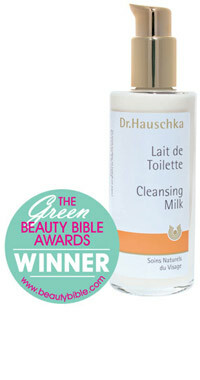 I start my morning routine with Dr. Hauschka's cleansing milk, I raved about this product a few posts back, but it really is amazing. Really natural and calming for my irritated skin and lasts for ages! Before this product I had Dermalogica's Ultra Calming cleanser, which, to be fair, I didn't actually mind, however, I still found my eyes to be a little itchy at time even if the redness wasn't visible. I would recommend this product though if you don't actually suffer from eczema, but if you just find your skin to be red and blotchy. I then move on to exfoliation, I don't always exfoliate but I love that tingling feeling you get when you have a good scrub! If I want to go fully exfoliating crazy I use St. Ives Apricot face scrub, this is an affordable well know scrub which really does the job! However, I've started using Dermalogica's daily microfoliant, this is a lot gentler on my sensitive skin and leaves my face feeling really clean and fresh. I definitely recommend using this in the morning as it gives your skin a smooth revitalised look. A product I tried a little tester of and loved is REN's Micro Polish Cleanser. I'll definitely be buying this when my Dermalogica runs out! Then, FINALLY! Most importantly moisturise!! Currently I'm using REN's T-Zone Balancing Day Fluid which I love! REN has never really disappointed me with any product I've tried. The Day Fluid is great for my skin which I can find can get a little oily throughout the day, the moisturiser actively reduces shine and protects the skin against free radicals. Another moisturiser I've tried is Clinique's Moisture Surge. I do like this product but I found it didn't leave my skin feel overly hydrated, I swear it evaporates in the pot as well! (Probably not but I'm suuure I had some left! ), also as I said earlier Clinique leaves my skin a little bit irritated! If I'm feeling extra tired (probably for an early 9 am lecture or something!!) I try and brighten up my dark under eye circles using Balance Me's Wonder Eye Cream. I actually got this product in a Glossybox and loved it so much I bought the full sized! So there we have it! I do tend to vary my products quite often, I seem to constantly be buying different things and having little bits of products left here and there! But, this is my routine at the moment, it suits my sensitive skin and is great for the cold wintery months! I'd love to hear of any other products for sensitive skin that I could give a try, so comment below and discuss! Oo I use the St Ives scrub! Would you say the Dermalogica is better?? Hmmm, I wouldn't say better but different! It's a lot gentler on the skin and can be use daily, where as St. Ives is more of a one week thing I think! Just had a cheeky peak at your blog, love it! !